Embedded C is most popular programming language in software field for developing electronic gadgets. Each processor used in electronic system is associated with embedded software. 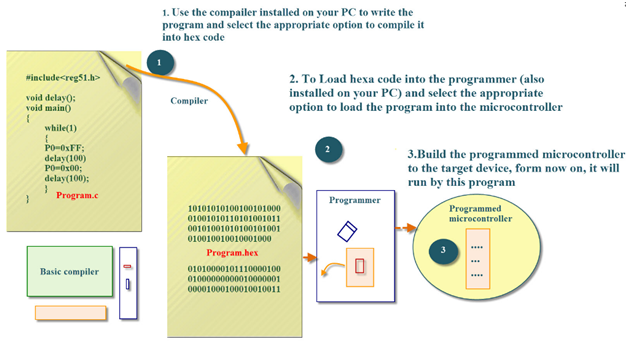 Embedded C programming plays a key role in performing specific function by the processor. In day-to-day life we used many electronic devices such as mobile phone, washing machine, digital camera, etc. These all device working is based on microcontroller that are programmed by embedded C.
The Embedded C code written in above block diagram is used for blinking the LED connected with Port0 of microcontroller. Function is a collection of statements that is used for performing a specific task and a collection of one or more functions is called a programming language. Every language is consisting of basic elements and grammatical rules. The C language programming is designed for function with variables, character set, data types, keywords, expression and so on are used for writing a C program. The microcontroller programming is different for each type of operating system. Even though there are many operating system are exist such as Windows, Linux, RTOS, etc but RTOS has several advantage for embedded system development.